In that perfectly postmodern way of our instantly nostalgic, Buzz-fed culture, Netflix’s Stranger Things plays on our loving remembrance of things that never really went away: ’80s horror films, Steven Spielberg, Winona Ryder, etc. This is also true of its biggest cult breakout (besides Barb): The ominous, pitch-perfect synthesizer score crafted by Kyle Dixon and Michael Stein, members of the Austin-based synthwave group Survive, which—when complemented by a smattering of period-appropriate songs from Echo And The Bunnymen, The Clash, and Modern English—effortlessly evokes the era with its overt hints of John Carpenter, Giorgio Moroder, and Tangerine Dream scores. When combined with the Stephen King paperback-evoking typeface of the main titles, Dixon and Stein’s music creates the instantaneous feeling that you’re actually watching Stranger Things on an old-fashioned tube TV back in ’83, perhaps running concurrently with V: The Original Miniseries. Stranger Things mania being what it is, naturally there’s already been demand for an official soundtrack album, which was recently promised as “coming soon.” But you don’t have to wait for that: Like so many of the show’s other elements, the kind of dark, mysterious synthesizer drones it uses to such chilling effect, the ’80s “music of the future,” never really went away—and well before the series brought it to such prominence, there’s never been a richer catalogue of the synthwave genre to explore than there is right now. Most obviously, you could start with Survive itself, which has been steadily releasing eerie, cinematic analog synth throwbacks since 2010, culminating in its upcoming sophomore full-length, RR7349, due Sept. 30 on Relapse. Prior to signing to Relapse, the group had been one of the lynchpins of the Austin-based Holodeck Records, a cassette-and-vinyl-based label formed by Jon Slade of Silent Land Time Machine and run by members of the many experimental, ambient, and electronic-what-have-you local groups it represents, including Troller, This Will Destroy You, and Survive itself. Dipping into the Holodeck catalog, you’ll discover many variations on Stranger Things’ retro aesthetic, from the slightly more industrial grit of Ssleeperhold to Troller’s Beach House-esque new wave noir to the Ersatz Audio-evoking, dispassionate dance music of Flatliner. It’s not a surprise to learn that Survive and so many artists of its ilk hail from Austin: As Dixon and Stein discuss in this recent Rolling Stone interview, they score a lot of their equipment from local analog synth store Switched On—where Stein sometimes works—and they get a lot of their inspiration from scouring the shelves of horror movies proudly served up on VHS tape at I Luv Video. Austin is a city awash in nostalgia; speaking as a former Austinite, perhaps no city besides New York is so in love with the way things used to be. That throwback affection extends to its permanent-midnight movie theater Alamo Drafthouse and its collectibles boutique Mondo, which—through its recently established partnership with Death Waltz—puts out beautifully packaged vinyl soundtrack reissues for some of the trashiest films ever made. Were it not coming out on Lakeshore Records, the Stranger Things score would have fit right in at Mondo/Death Waltz (or similar labels like Waxwork or One Way Static), where fans can find plenty of the same dark moods in its impressive back catalog of soundtracks to John Carpenter, Dario Argento, and Lucio Fulci films, as well as those to more recent titles like Maniac, Synchronicity, Starry Eyes, and Beyond The Black Rainbow. Of particular interest to Stranger Things diehards might be the score for Adam Wingard’s own ’80s throwback, The Guest, composed by Steve Moore of horror-synth stalwarts Zombi (and Survive’s new Relapse labelmate). Mondo has also distributed soundtracks by composer Cliff Martinez, whose score for Drive—as indebted to Tangerine Dream’s score for Michael Mann’s Thief as the rest of the movie is—could be considered the ne plus ultra plus satin jacket of this current ’80s synth revival. Of course, Martinez has been at this since the actual ’80s, beginning with his early, slightly more ambient work for longtime collaborator Steven Soderbergh. But his compositions became notably more pulsating and heavily synth-based around the underrated soundtrack for 2002’s Narc, and it’s a style he’s honed across other great, sleeper scores for movies like In The Beginning, The Lincoln Lawyer, Contagion, and more recently, for The Neon Demon and Cinemax’s The Knick. Martinez’s work on Drive, while influencing scads of other musicians to chase its vintage synth sounds, was in turn heavily influenced by Johnny Jewel of Glass Candy and Chromatics, who was originally tapped to score the film before the studio hired Martinez to create (with his help) an imitation of Jewel’s work. Jewel would later release his own Drive-inspired material under his Symmetry moniker as Themes From An Imaginary Film. You can find it—along with all the other dreamy, Italo disco-inspired soundtracks Jewel has produced for films, both real and imaginary—on his label, Italians Do It Better. Echoing Jewel in creating scores for films that don’t exist—and rivaling him in prolificacy—is producer Matt Hill, better known as Umberto. As his stage name suggests, Umberto also draws inspiration from Italian synth-based music, most notably that of Fabio Frizzi and Goblin. Most of Umberto’s releases—Night Has A Thousand Screams, Prophecy Of The Black Widow, From The Grave…—have titles and cover art resembling lost giallo movies, though on 2013’s Confrontations, he lessened his ’70s prog influences in favor of an ’80s sci-fi aesthetic that leaned more heavily toward Carpenter and Moroder. Umberto’s 2016 release Alienation is his most personal—and atypical—album yet, containing strains of all his previous work but also bits of melancholy, dream-pop-influenced drift. Umberto has also frequently paired up with like-minded composer (and fellow pretend-Italian) Antoni Maiovvi as The Hook & Pull Gang—with whom he did a live rescore of The Texas Chainsaw Massacre for the Alamo’s MondoCon—and Law Unit, where they created a sort-of imagined soundtrack for some lost, post-apocalyptic cop thriller. On his own, the Berlin-based Maiovvi (real name Anton Maiof) has been just as busy, producing more than a dozen albums and EPs that blur the line between horror soundtracks and Hi-NRG dance music. The label that puts out most of Umberto’s work, Not Not Fun, is also home to Xander Harris, the stage name of Buffy The Vampire Slayer fan Justin Sweatt, and another Austin-based artist whose albums like 2011’s Urban Gothic and 2013’s The New Dark Age Of Love have the same late-night horror-thon vibe. (For a slightly more contemporary vision, check out his 20th-anniversary tribute to Neal Stephenson’s cyberpunk classic, Snow Crash, available at a name-your-price donation.) Not Not Fun also plays host to Jonas Reinhardt—a band, not a man—whose albums like Mask Of The Maker blend Carpenter-derived car-chase themes with krautrock grooves. Not Not Fun, Italians Do It Better, and Mondo are all preceded by the U.K.-based label Ghost Box, whose output—heavily steeped in a faux-archivist narrative regarding pop culture artifacts that never actually existed—was rigorously designed to look and sound like library finds from a parallel world. Its sense of nostalgia, an amalgam of familiar yet slightly “off” touchstones from the ’60s through the ’80s, spurred music writer Simon Reynolds to borrow the Jacques Derrida phrase “hauntology” to describe its time-slipped retro-futurism (which could also apply to Stranger Things). Though much of Ghost Box’s output treads toward musique concrete, both The Advisory Circle and especially Pye Corner Audio traffic in the sort of Cold War-era synth moods we’re looking for here. Ghost Box’s out-of-time aesthetic also governs New Retro Wave Records, a loose consortium of Soundcloud- and Bandcamp-based artists with names like Futurecop!, Timecop 1983, Waveshaper, Zombie Hyperdrive, and Kick Puncher—all seemingly united by a mutual love of ’80s B-movies, Miami Vice, and Sega Genesis-era fonts. In fact, click on the “synthwave” or “retrowave” tags on Bandcamp, and you’ll be greeted with dozens upon dozens of these sorts of groups plying dark synthesizer sounds and slathering themselves in neon pastels, Tron grids, and sweet Lamborghinis. These include more celebrated acts like Melbourne’s Power Glove (whose work on the ’80s retro-futurist Far Cry 3: Blood Dragon has arguably proved as influential on bedroom producers as Drive); the punishing Carpenter Brut and Perturbator; and the dreamy new wave of Gunship. But you’ll also find endless pages of artists like Miami Nights 1984, Night Runner, Street Cleaner, Voyag3r—you get the idea—all of them trafficking in these same analog synth sounds and mid-’80s aesthetics. 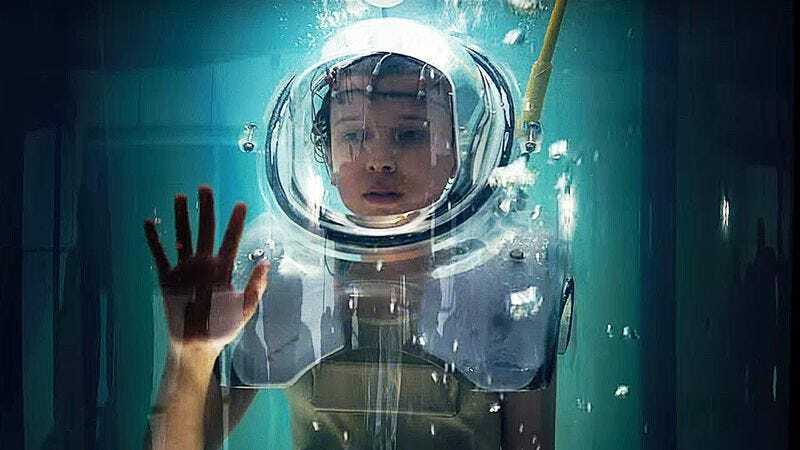 There’s so many that you have to wonder how Stranger Things creators the Duffer brothers even managed to find Survive in such a huge sea of sound-alikes. Regardless, the attention currently being paid to Stranger Things could be a boon for these many, many artists already hitting that same nostalgia spot—and the popularity of the show’s soundtrack represents the synthwave genre’s biggest mainstream exposure, even as its influence can already be heard all around. Artists like Com Truise have enjoyed some crossover critical and commercial success plying a more dance-friendly version of John Carpenter scores, while strands of their DNA have also become more pronounced in recent work by established artists like Alessandro Cortini, Blanck Mass, Barnett + Coloccia, Not Waving, and Trentemoller (whose title theme for AMC’s own ’80s-set show Halt And Catch Fire is practically a blueprint for Stranger Things). Even Carpenter himself has seized the moment, recently releasing two albums of his own imaginary Lost Themes and embarking on a national tour playing them alongside his iconic film scores. Of course, just as Stranger Things itself can feel like a pastiche of its many inspirations, there’s a certain formulaic repetitiveness to synthwave; the fetishization of the same analog gear and small frame of reference is limiting in a way that artists may embrace, but it doesn’t leave much room for innovation—or surprises. Still, its creepy pleasures are undeniable, and once you’re locked into them, there’s an endless wealth of them just waiting to be discovered and endlessly rehashed. Synthwave’s “music of the future” just keeps going, forever existing out of time.